In this cooking video, I show you how to blanch (also called par boil) green beans. It’s pretty much the same technique I use across most of my green vegetables; it’s very simple to do; and it helps ensure that you have bright green, properly cooked green beans. Blanching green beans can also be a great time saver, as you can blanch the beans well ahead of when you actually need them, and then right before you’re ready to serve just give them a quick, 30 seconds cooking and you’re good to go. I’ll use this technique anytime, I have a lot of cooking to do at the last minute. 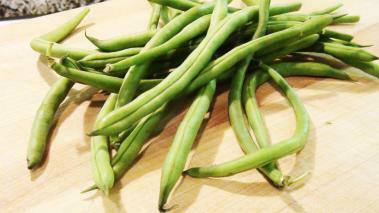 While there are many reasons to blanch green beans, really it comes down to two things for me. While blanching may add time to the whole cooking process, it can actually be a really help when it comes to managing the clock. Adding the blanching step does indeed add about extra 10 minutes to the process, BUT you can do so hours (even up to a day) ahead of time. Then when it comes time to actually serve the green beans, you can heat them up for about 2 minutes, and that’s when the time savings really helps you out. As I’m trying to finish the chicken, the fish, the pork…(or whatever I’m cooking) while at the same time, pour drinks for the family and set the table, I’m more than happy to have the green beans off my plate (pun intended). They are already 90% cooked, and sitting in the fridge. I can pull them out literally 5 minutes before the plates hit the table, quickly heat them up and serve, without breaking a sweat. The other reason why you should blanch greens beans, is you simply end up with a better bean. When you blanch properly, the bright vibrant color of the bean keeps all the way to dinner plate. If don’t blanch the beans, then as they cook from raw to cooked, they tend to turn a dull, drab, blah,grey-ish…some may say puke (but I won’t go there as I run a very respectable blog here) green, that looks like it just came out of can packed in the ’50s. But In addition to color, you’re far less likely to over or under cook green beans when you blanch them. Given you’re probably blanching them in advance, your likely going to be paying more attention to cooking them, and it’s relatively easy to get them cooked perfectly when blanching - firm, not mushy. Shocking them in cold water stops the cooking process, and then when it’s time to serve, re-heating them is so quick and simple, so you won’t overcook them. Blanching them is about as foolproof as it gets. Of course, blanching doesn’t stop at Green Beans. You can blanch a ton of vegetables, and the benefits are really amazing. Check out my blanching page, and be prepared to be wowed!